Why Domino’s Pizza? Why not just a pizza delivery AR app or a food delivery AR app? Because Domino’s is not just any pizza delivery service, it’s one of a kind. Domino’s takes pizza delivery to the level of hi-tech while remaining intuitive and user-friendly. Ordering pizza with Domino’s augmented reality app becomes a unique experience that turns users into loyal customers forever. However, while for the users the process is as easy as one-two-three, sophisticated mechanisms are working there in the background to make it possible. Domino’s is set to try every technology on the market to make pizza ordering as smooth and straightforward as possible. Voice recognition, driverless cars, augmented reality, 3D models – Domino’s uses all of them, and even more, to maintain the reputation of “an e-commerce company that sells pizza,” as Dennis Maloney, Chief Digital Officer of Domino’s, described the ultimate goal of the brand. Of course, such focus on the AR technology makes Domino’s stand out from among the competition. While being on the receiving end of massive criticism for investing too much in the hi-tech stuff for such a mundane thing as cooking and delivering food, Domino’s is winning more and more customers, millennials mostly. About 60% of its business comes through digital channels, so, maybe, Domino’s was right to target that market sector. 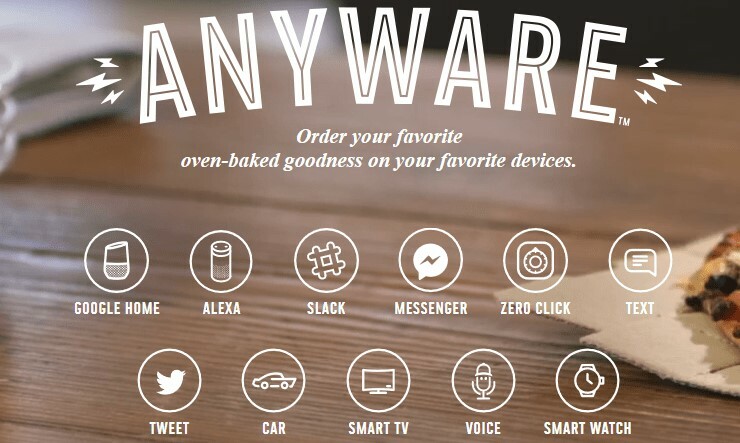 Today, you can order Domino’s pizza from almost any connected device. It has adapted its service to work with voice assistants, messengers, mobile AR app and other smart appliances. One of the main means of reaching the customers and doing its business is Domino’s AR mobile app. The company recognized the importance of the mobile platform early enough and chose the mobile-first approach to digitizing its service. The iPhone version of Domino’s app was released in 2011, with the Android version following one year after that. Let’s try to reverse-engineer the functionality of Domino’s Pizza augmented reality app to see what it is made of and how much an AR app can possibly cost. As we said, Domino’s walked the mobile-first path focusing its effort on creating the most intuitive, responsive, user-friendly augmented reality app reaching the maximum audience. To achieve that goal, the brand chose to build two native applications with augmented reality rather than a cross-platform one. Native app development has a number of advantages over the cross-platform approach. Native apps generally show higher performance and are better suited for long-term perspective with the option of adding new features, for example, an augmented reality. With native apps, integration of APIs and other third-party components is easier and more effective. Food delivery apps, even with minimum functionality, will require third-party integrations, for example, payment engines and map services. Thus, the native development approach is justified in this case. As most services augmented reality apps, Domino’s Pizza requires registration to be able to use the AR app. Together with the common registration option with the email and password, the augmented reality app also supports signing up with social network accounts. For users, social sign-in means less hassle, as they do not need to create and remember one more password and fill in their profiles – the AR app will get what it needs from the social profile. For Domino’s social sign-in opens another promotion channel, as users can easily share their experiences in social networks, thus bringing the brand a broader exposure. User registration creates the base for other features, such as order history, feedback, and loyalty program. They are tied to user profiles, thus creating a profile should be the starting point in using the AR application. Moreover, user profiles allow storing their delivery addresses, so that users do not need to enter the address with each new order. In addition to the standard Domino’s menu offering dozens of pizzas, sandwiches, drinks, and desserts, the AR app also has a DIY option. Be your own chef and build your pizza the way you like it. Add whatever ingredients in whatever crazy combinations you want. The Pizza Chef feature is specially designed to allow users to create their own pizzas. However, Domino’s would not agree to something plain and well-worn, like a list of checkboxes. No, for a tech-savvy brand like Domino’s it’s nothing less than augmented reality! In the Domino’s AR app, you will watch your pizza build itself right on your kitchen counter or desk. Add your pepperoni or bacon, olives or pickles – and immediately see the result. When you are happy with your pizza, tap Checkout and wait for the real twin of your virtual pizza to be delivered to your door. Once you have ordered your dinner, it is always nice to know how long you still need to wait before it arrives. 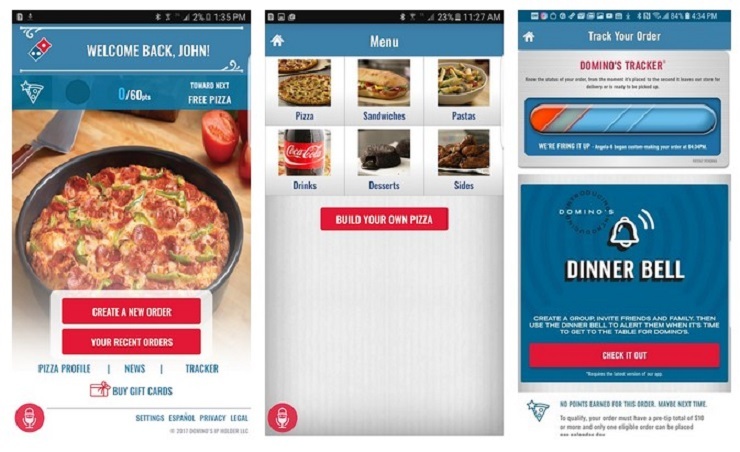 To make waiting easier, Domino’s Pizza included the GPS tracking option in its AR app. You can watch your pizza moving to you in real-time. Moreover, Android users can broadcast the pizza route on their TVs with the Chromecast feature. Following your dinner on the map can become a party entertainment or a family fun activity. In addition to allowing users to track their orders, Domino’s uses the GPS tracking feature to plan the safest routes for their drivers. No address – no problem! Domino’s can deliver your order to a beach or a park or a swimming pool if you happen to get hungry while hanging out on your day off. Even if you are waiting to have your flat tire fixed at a roadside gas station, they can deliver there, too. The feature was launched at the beginning of 2018 with about 150,000 hotspots. It is a complex integration of the GPS tracking and location resolution and map service. The AR app pinpoints your current location and offers a number of delivery hotspots nearby. Select the one that is the most convenient for you and provide the instructions for the delivery person to find you. 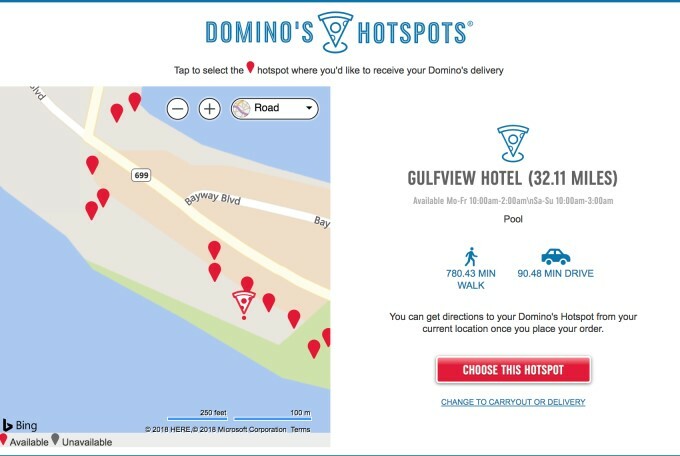 In addition to the hotspot locations initially programmed in the augmented reality app, Domino’s invites its customers to suggest other locations that can be also included in the service. The Dinner Bell is a new cute feature of Domino’s. In Domino’s AR app, you can set up groups and invite your friends or family. When you place an order for the group, the feature notifies everyone about that. Once your order for the whole group is out for delivery, the bell rings again on each of your group members’ devices calling them to the table. The Dinner Bell feature lets people plan their time better and continue with their usual activities while waiting for the pizza to arrive. Domino’s Pizza supports multiple payment options – you can pay with all major credit cards, PayPal, Apple Pay, and Google Pay for iOS and Android, respectively. Even the cash option is supported for orders to be picked up from a Domino’s store. Such flexibility is achieved by integrating third-party APIs allowing including the payment service in the Domino’s Pizza augmented reality app. The options are offered during checkout with the payment processed immediately. Domino’s Pizza runs its loyalty program, Piece of the Pie. Customers who enroll collect points for any orders with Domino’s, regardless of how they place it. When their count reaches 60 points, they can order a free pizza. Loyalty programs are an excellent tool for user retention and engagement. Once you have a profile with the service, you will be more likely to place your next orders with it to see your account growing. Moreover, the rewards play their role, too. In addition to offering points and rewards, Domino’s also ran a promo campaign where it launched a game for the Piece of the Pie members. Once you complete all levels, you get bonus points to your account. Fun and rewards – a superb recipe for retaining users! How much will it cost to develop an AR app like this? Now that we have outlined the main features of the Domino’s Pizza AR app, let us see how much it may cost to create a food delivery augmented reality app with similar functionality. We will base the calculation on building two native augmented reality apps, just like Domino’s did, but if you choose the cross-platform approach, the total cost may be somewhat lower. 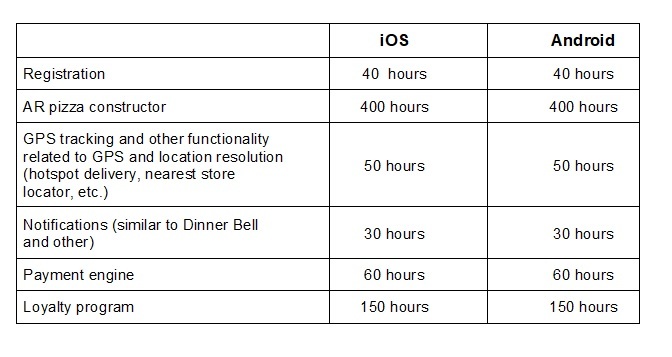 The cost of augmented reality development is directly related to the number of hours needed to complete each of the AR app components. With the average AR development rate of $80-$120 per hour, the cost of augmented reality development for each platform, depending on the complexity of its functionality will be in the range of $58,400-$87,600. We believe that, for a restaurant business, a delivery AR app is a must-have. People tend to spend more and more time with their smartphones relying on them in almost all spheres of their lives. Adding your icon to their screens will increase your reach and recognition. As you can see from the example of Domino’s Pizza AR app, a food delivery augmented reality app can be as technology-packed as it can possibly get. By the way, right now Domino’s is experimenting with the voice recognition feature in its mobile augmented reality app, so quite soon we may be able to order our dinner without even touching the phone. Technology can be made to serve any purpose turning ordinary experiences into something new and unique. As we just saw, even such advanced tools as augmented reality can enhance food ordering. Let your imagination run free – and we can help you turn it into reality. If you are interested in AR and need somebody to consult you on augmented reality application development, you should contact a reliable and experienced augmented reality app development company. Jasoren is exactly what you need. We have a team of skilled augmented reality developers who can consult you on questions related to your project. If you want to know more about how much augmented reality costs and estimate the budget required for your ideas to come true, you can also rely on us. Contact us, and we guarantee that you will get the most out of augmented reality.